Today I’m talking about some important things. When the company starts to outsource, does that mean your job is at risk? How can serving others help you as a leader? Tom: I have to pause here for just a minute to say that there was a time when I was exactly like Dan. I was so task focused. I had a lot of things to do. I mean, I just needed my team to get out of the way so I could do the important work. But John’s response to Dan floored me. He said, “Dan, you just walked past your work.” Never forget that leadership is about people. Leadership is about people. Dan did care about his people and so did I, deep down. But both Dan and I made the same mistake. We failed to show how much we valued people in a way that they could feel and understand and appreciate. Man: Becoming a Geek Leader, Season Three, Episode Eight. Also, is your company planning an all-hands meeting? I can help your leaders plan a productive and memorable event. I can professionally facilitate your meeting and deliver content that is completely aligned with your goals. Here’s what Erin Kwon said after having me speak for her statewide association. Erin: I really enjoy working with Tom because he is practical and down to earth. He brings really good content. He’s very engaging as a speaker and I think the audience really connects with him. They not only get the content but they also get an entertaining presentation. So I would definitely recommend working with him. I will certainly call him in the future for any events that I have. Tom: Check out brighthillgroup.com/speaking. That’s brighthillgroup.com/speaking, for testimonials, videos of me on stage, information about my most popular topics and more. I’ve promised you on the podcast I’m sharing what I’m learning, and today’s episode is a clear example of that. Today I’m talking about what it takes to get a promotion at work. And I’ll be sharing some of the many, many things I did wrong that actually held me back in my career. And in the Coach’s Mailbox segment, I’m answering a question about outsourcing. 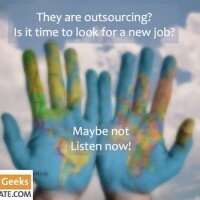 What do you do when your boss tells you outsourcing is coming? Is it time to quit? And I’m talking about John Maxwell’s “Law of Addition,” that leaders add value by serving others. Man, we have so much to talk about, so let’s get started. Tom: In today’s mentoring segment, I wanna talk about goal setting, specifically goal setting when it comes to your career. Now, this is something that you can start to use when you’re at level one of the four levels of thinking as a geek leader. Tom: At level one, you may even be a superstar technical resource. Level one focuses you on improving your technical skills. As I look back on my career journey, I really didn’t know what I wanted to do. I knew I wanted to work in technology, and so, from the time I was even a pre-teen, I loved technology. I wanted to work with computers. And so I was really passionate about that, but I wasn’t clear on exactly what that meant. So what I did was, I focused on my technical skill development. And I really [inaudible 00:04:18] think that much about which skills I wanted, I just wanted a job, and I found some geek work. And generally what I did was I just kind of followed along with whatever my employer wanted. “Oh, you need to solve a problem related to X? I could learn how to do that. Let me look at that and I’ll get back to you.” And that’s how I started doing networking. And after accidentally making that choice, I eventually became somewhat of an expert in data networking and writing code and building systems that shared data and protected networks from attacks and extended communications around the globe and even into space. And later, I was asked by an employer to solve problems with software deployment, software delivery and installation on remote machines. And over time, I became somewhat of an expert in the software tools and even wrote many tools to assist in that process. And even later, I was asked to look into identity management and how could I solve problems with that. And I spent a lot of time digging into those types of technologies. But my point is this, I really didn’t have a plan. I didn’t know what I wanted to be when I grew up, I just knew I wanted to keep doing interesting work. And I was having fun. I was solving problems. And most importantly, I kept getting paid more every year. So, it was all good. But here’s the thing. I remember I was in one position and I’d been in that role for maybe three years. And I was growing at my technical acumen and I was getting better and better at delivery of the technical stuff, but I had this realization that suddenly hit me. First, I wasn’t getting promoted anytime soon, as far as I could tell. And second, I actually had no idea what it took to get promoted. And eventually, I talked to my boss about it, and this is what my boss said. He basically said, “Tom, you’re doing great work. There’s nobody else on the team who can do what you do. And by the way, it’s actually your job to do that great work that you’re doing. So, really, you’re meeting my expectations. Why would I promote you?” Ouch! It didn’t matter that I was smart or that I was hard working. I wasn’t even being considered for getting a promotion. Wow! I was shocked. But who could I blame? I mean, I didn’t really even have a plan. Not only that, but my belief about what it took to get promoted, that was wrong too. It’s no wonder I felt like I was stuck. It was on my journey when I bumped into Ed. Now, Ed was a coworker. He was ahead of me in his career. And I was blown away when he made an offhand comment about his plan for his career. You know, this didn’t start out as me going to Ed and saying, “Ed, I’d like to hear from you about how I can improve in my career.” Actually, it was kind of an offhand comment that he made about having a plan. It was really all about him. It wasn’t about me at all. And I think at that point he might have been a senior director in this big company where we both worked. I was just astonished when Ed said, “I have a plan. In five years, I wanna be an executive vice president in this company.” Now, in the company we worked in, that would have been lightning fast. He would have had to go from Senior Director to Vice President, and then from Vice President to Executive VP. Those are two big promotions in a row. Even if you’re a fast mover, it was not an uncommon thing for you to spend at least five years in each of those levels. And here he was saying he wanted to cover 10 fast years of career growth in just five years. That’s crazy, right? But what do you think happened to Ed? He actually did it. He set a goal, he told people about it and he made it happen. Now, it wasn’t magic and it wasn’t like he was just walking around whining about how he wanted a promotion. Actually, what he did was, he spent time looking at the next role. So when he was a senior director, he was looking at Vice President. What skills, what network, what capabilities did he need to have to perform well in that role? Once he had a clear picture about what he needed to have, what abilities he needed to deliver in that next role, he began to work intentionally on finding experiences and opportunities to grow those skills and to demonstrate those skills. And while he was doing that, he was consistently delivering the expected work for his current role. He made clear to everybody around him that he was looking for opportunities to move up and that he was willing to take on tough projects that could help him gain the skills he needed. And these skills might have been in his wheelhouse already, but realistically, as he wanted to step up to those higher levels, he actually had to step out of his comfort zone to develop some skills that were not natural for him and not comfortable for him. So he did get a promotion to Vice President, and he served in that role for a few years. And eventually, on schedule, he left that job to become a CTO. So he wasn’t the executive vice president that he aspired to, but he moved to a C-level role within a division of another large company. And he did it within the timeframe that he had planned to do it. So let’s take just a second to reflect on the difference between Ed and Tom. See, Ed had a plan. He took action on the plan and he proactively looked at the skills, the relationships and the accomplishments he needed to be fit for the right role, at the right time. And he looked around to watch how others were succeeding. What was the key for that person? What was the organization valuing? The people that were getting rewarded, why were they getting rewarded? And he did those things, and he did more too. Now, what about Tom? I just showed up. I did strong technical work and I expected that somebody was gonna notice and reward me. But how do you think that worked out? You know, Jim Rohn says, “If you don’t have a life plan, then you’re gonna fall into someone else’s plan.” And do you know what they have planned for you? Not much. The thing is, your career advancement is gonna take off when you decide what you want, when you tell people about it and then you do the hard work to get the skills you need to fulfill that role. Having a plan about your career growth, that’s today’s mentoring segment. Steven, the skills you’re gonna need to handle this are skills you can start to use when you’re at level one of the four levels of thinking as a geek leader. Man: Level one: Individual. At level one, you may even be a superstar technical resource. Level one focuses you on improving your technical skills. Tom: So, should you quit? Look, Steven, that’s a common concern when we start to talk about outsourcing. It’s a worry that a lot of folks have, and in some cases, it’s a really serious worry. For a while, I worked for a large company that eventually did outsource their entire IT department. And now they’re bringing it back in-house, but that’s a topic for another episode. Most of the time, it’s not that bad. And candidly, most of the time, it’s not that they’re looking to get rid of you. That’s usually not the case. Now, I know that that does happen sometimes, and I’ve got some clients I work with where that is exactly what the company’s doing. And we’ve got to help my clients figure out how they’re gonna make the adjustment. But most of the time, it’s just not that bad. In fact, this can be an opportunity for you to deliver even more value and increase the impact of your skills that you bring into the business. Now, I know as a geek there’s a pretty good chance that your gut reaction when you hear the word “opportunity,” you think I’m playing Buzzword Bingo. But I’m not. Let me be really specific. Time and again, I have watched highly technical experts step into roles and become brilliant in their niche. And think about Bill and how great he was at desktop hardware and operating systems internals, or James and how he completely understood telephone call detail records, or Steven and how competent he was in understanding the nuances of the core engine of our product. Each of these guys was an ace, top of their class. Each one stepped in and they got more and more deeply involved in their chosen technology until they were always the smartest guy in the room when it came to their stuff. Now, what happened is, all those guys, unfortunately, all of them, fell into a trap, and it’s a trap I’ve fallen into as well. The trap is this. When you’re the only person who knows how to do something, you’re the only person who can do that thing. And that means two things to you. If you’re the only person who can do a specific thing for the business, one, you will never be able to stop doing that job. You will have that job for as long as you are employed. And two, you will never be able to deliver more value to the company than you did back in the good old days when you slayed that dragon that you work on each day. See, there was a time when the company didn’t have any idea how to solve the problem that you work on right now. And you’ve been involved in solving that problem and delivering great value with that solution. But the trap is, if you’re the only guy who can work on that solution, if you’re the only one who solves that problem, now that problem is solved. And you know this. You know that technology changes. That hot, high-performance toolkit that was incredible five years ago, is yesterday’s news now. The newer stuff is so much better and stronger and more powerful. And you know that the market has changed. The business problems that were very exciting to the client at the time are no longer nearly as interesting because the marketplace is different now. So, here’s the opportunity. Your schedule is probably filled with enhancements, maintenance, and operations on your preferred technology. And you’ve probably thought to yourself from time to time, I’d like to fix X, but we’ll never get support to do that. And even if we did, when would we have time to work on that? Now is the time to increase the impact you’re gonna make by investing in the stuff that the company needs but they just couldn’t spare you because you were the only person who could work on that. Now, I just have to pause here. Hang on one second. I’m talking about what the company needs, not only what they need, but what they think they need. It’s not about your backlog of technical debt, because I know that there’s a good chance if you’ve been working on a particular set of technology for a long time, there’s been a hot list of things that you really would like to refactor. And they may be very helpful to the company if they were refactored, but candidly, they might not. They might not deliver the kind of value that the company needs. And remember, I’m talking about what the company thinks it needs. Now, it’s possible that your technical debt is actually a looming crisis for your company, but I’m pretty confident that unless that technical debt has actually caused customer-facing outages or it has actually caused the sales demo system to fail in the middle of a sales pitch, that the business leaders aren’t gonna believe that’s their number one priority. Your goal is to be seen as a high impact expert, right? Wouldn’t it be great if you could solve some of the most pressing issues the company was facing? If you could look at your product pipeline and looking at the things that are on the project list, to figure out how you could free yourself up. What if you could break that project list into two categories of work? The first category of work is technical work that requires strong and capable developers. It’s work that’s got a clear scope and it’s got a reasonable timeline for delivery. It’s work that you can easily package up to be outsourced to smart offshore developers. And the second category of work, and we all have these types of projects, they’re kind of spongy and soft. Maybe the scope isn’t completely clear, the deadline is pretty urgent, the business problem is pretty urgent and you’ve got rapidly changing requirements and maybe a set of stakeholders that’s changing pretty fast. That kind of project just isn’t suitable for you to push out the door. That’s why companies need you. That’s why they need you to step in and do that. So, many times companies aren’t looking to get rid of you. They’re looking to find ways to deliver higher value at a lower cost. So, assuming that’s the case, what if you lead the charge to get that first category successfully handed off to a competent partner? And in doing so, what if as you handed that work off, your daily work off, to somebody who could do some of those tasks, what if that freed you up to find creative and valuable solutions to that second category of work, that high urgency, high business value category of work? Or what if it allowed you to cope with possibilities when it comes to your technical debt that you haven’t had time to think about? I mean, just as an example, maybe, maybe instead of refactoring the entire business engine for your app, which would improve performance and get you new technology and wipe out a bunch of technical debt, right? Maybe instead of refactoring that whole thing, maybe you could find ways to leave that code base intact, but you came up with a set of APIs that would allow that engine to keep running and would allow you to get other projects carved off and handed to somebody else. I’m not saying that you stop using your technical skills. You’re gonna continue to use those core skills. You’re still gonna continue to be the go-to person. You’re gonna deliver those technical solutions and you’re gonna focus on delivering higher value work, personally. You’re doing that while you’re finding a way for the important but candidly, the lower value work to be competently handled by somebody at lower cost to the company. It’s really a good business decision for you and it doesn’t require you to compromise on your technical acumen. That’s really what becoming a geek leader is all about. It’s finding ways to deliver higher value, be recognized and rewarded for the contributions you’re making. So, Steve, getting back to your question, I guess you have to assess whether you think your boss and the other leaders are making deep cuts or if they’re just trying to refine the business model to deliver faster and higher value. Now let’s take just a minute and walk down the dark path together. Let’s assume the handwriting’s on the wall and they’re gonna cut you and everybody else. Even in the worst case scenario, I think you have an opportunity to grow your skills, to find ways to work with outside teams, to work with people from different cultures and languages and locations and time zones. Those are skill sets that you’re gonna definitely need in your career. If you’re not using them today, it’s not gonna be long before you’re gonna need that. Globalization is a real thing. And whether it’s working with diverse team members in cities across the U.S., or whether you’re working with people across an ocean, if you wanna be seen as a strong performer, having skills in this area, it’s only gonna be a win for you. And I wanna just remind you that as you move up in your career, your boss is not really measuring your success by the work you do with your two hands. Your boss is measuring you by the work you deliver as you work with others. Maybe those people report to you. Maybe they work on your team as peers with you. Or maybe these are people that you work with across teams. As you move up in your career, it’s not enough for you to want to be able to deliver personally, you’ve got to be able to enable and empower others to deliver value if you wanna keep getting raises. I mean, that’s the deal. If you focus entirely on what you personally can deliver and just get out of my way and get stuff done, there’s a limit to how much you’re gonna be able to make. What you wanna do is continue to raise your game, to raise your value. Because the skills that got you here will not get you there. Now, let’s talk about, just for a second, if it’s not the worst case, right? Because the worst case, that dark path was if they were gonna cut you. If your leaders are generally trustworthy folks, then I think I’d be working on helping them make this partner strategy a success. The skills and capabilities you gain in the process are gonna be valuable to add to your toolkit. As I said before, the world is getting smarter, at least in part, because of the technology tools you’ve been building during your career. So, Steve, I think the ball’s in your court. What do you think you should do? And that’s today’s Coach’s Mailbox. Tom: Let’s talk about the “Law of Addition,” that leaders add value by serving others. And this is something you’re gonna start to tackle when you’re at level two of the four levels of thinking as a geek leader. Man: Level two: Team member. Level two is where you work well with others and together you all succeed. Tom: In a time when CEOs are often paid hundreds of times what the average worker is paid, Costco’s CEO Jim Sinegal stands out. Jim’s salary is far lower than that of the CEOs of his competitors. And fundamentally, Jim believes in paying his team members well and offering them good benefits. On average, they’re paid 42% more than their closest rival, and they have high employee loyalty. Sinegal keeps an open door policy with team members and he visits every store, every year. And when a company like Costco has been so financially successful over the years, many leaders would be bragging about how great they are and how much good stuff they’ve done. But in contrast, Jim says, and I quote, “It is improper for one person to take total credit when it takes so many people to build a successful organization.” Jim gets it. He really gets it. Not only that, but he cares about his team members and he shows it by serving them in ways that demonstrate his care for them. John Maxwell says, “The bottom line in leadership isn’t how far we advance ourselves, but how far we advance others. This is achieved by serving others and adding value to their lives. The interaction between every leader and follower is a relationship, and all relationships either add to or subtract from a person’s life. If you’re a leader, you’re having either a positive or negative impact on the people you lead. There is one question. Are you making things better for the people who follow you? That’s it.” Period. John writes, “How do I know? Because people are selfish. I’m selfish. Being an adder makes me step out of my comfort zone every day and think about adding value to others.” If John Maxwell, the worldwide guru, the number one influencer on leadership, needs to constantly step outside his comfort zone and remember to serve his people, don’t you think you and I need to do the same? I have to pause here for just a minute to say that there was a time when I was exactly like Dan. I was so task focused. I had a lot of things to do. I mean, I just needed my team to get out of the way so I could do the important work. But John’s response to Dan floored me. He said, “Dan, you just walked past your work.” Never forget that leadership is about people. Leadership is about people. Dan did care about his people, and so did I, deep down. But both Dan and I made the same mistake. We failed to show how much we valued people in a way that they could feel and understand and appreciate. So what’s the payoff? Why should you make the time to invest in others and add and serve them? I just want you to take a moment to think back over your career. I bet you remember there were some bosses you liked and others you didn’t like so much, right? Well, when you think about the good ones, wasn’t there an aspect of them helping you? And if they were helping you and helping other team members, wasn’t that a part of making the team highly productive? The fact of the matter is that relationships tend to drift apart. Without intentional help, relationships rust. They decay. And that’s compounded by people who don’t even realize they’re being subtractors. They’re accidentally making withdrawals from an account that has less and less money in it. And eventually, that account is overdrawn and the relationship is severely hurt. And that often happens entirely by accident, through unintentional neglect. So even if you’re not the official boss, you can serve others. You can build up the team and you can add value to them through your service to them. So let me ask you, will you do it? Are you adding value to your team members? And how would you know? What are some steps you could take to show value to them? The law of addition, “Leaders add value by serving others.” And that’s today’s John Maxwell thought leader segment. Tom: In today’s episode, we talked about what do you do when your boss wants to start outsourcing the work you’re doing. How should you respond? We also talked about the law of addition and how we need to intentionally help serve and add value to others. And we talked about career development. What does it take for you to move ahead? And of course, you’ve got to be thinking like a geek leader in order to be ready to step into that next role, but let me ask you, have you decided what your next role might look like? For today’s episode hack, I wanna encourage you to think about your career. What’s the next logical step for you to take? Do you wanna be a people leader or do you wanna be a deep technical expert? Either way, what skill should you work on next to prepare you to step into that role? As you think about that role that you wanna hold next and then evaluate what’s one skill that role is gonna require for you to acquire that’s gonna make you a better fit? Having a plan and then taking baby steps, like writing down the skills you wanna grow, it’s a great way for you to begin to make progress. And that is today’s episode hack. Hey, can I ask you something? Did you hear something helpful on today’s episode? Why not share it with a friend? On my iPhone, it’s as simple as hitting the three little dots on the bottom right of the screen, selecting “Share Episode,” enter your friend’s email and hit “Send.” Why do this? Two reasons. One, your friend or coworker will thank you. You’ll be seen as a source of helpful and valuable information and they will appreciate you for it. And number two, I need you to help me get the word out about this podcast. I’m working hard to bring great ideas and great content to you and it’s a big help to me if more people hear those ideas. Go ahead, share it now. I’ll wait. Thanks.